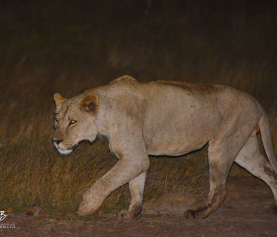 Lion Guardians – Kenyan lions face extinction in 20 years? Kenyan lions face extinction in 20 years? Home / Community work / Kenyan lions face extinction in 20 years? A report in the Telegraph on Tuesday suggested that within 20 years lions may become extinct in Kenya. This follows a press release from KWS (Kenya Wildlife Service) which says that Kenya is losing an average of 100 of its 2,000 lions every year due to growing human settlements, increasing farming, climate change and disease. According to KWS figures, there were 2,749 lions in Kenya in 2002 and their population dropped to 2,280 by 2004 and to roughly 2,000 today. They say that if the current decline rate continues, there won’t be a single lion surviving in Kenya in the next 20 years. There is no doubt that the numbers are in freefall. I’d be surprised if they even last as long as 20 years, said Dr Laurence Frank, project director of Living with Lions, the umbrella organisation of the Lion Guardians. Laurence said: When I first came here 30 years ago, you would always hear lions roaring across the rangelands at night and see their tracks in the morning. Now that is very rare. The reason is simple; lions eat cattle, and as the numbers of people grow, the numbers of cows increase. Alongside that there are ever more efficient ways, including poisoning, to kill lions. Click here to read the full story. Living with Lions and the Lion Guardians are working to reduce the conflicts between lions and livestock, so that there is less incentive for people to kill them. 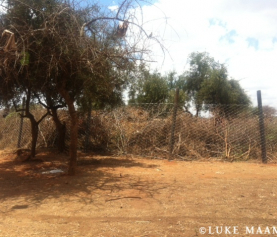 By doing things like warning herders to avoid areas where lions are present, finding lost livestock and helping communities to make their livestock enclosures predator proof (as in the photo below) the Lion Guardians are helping put a stop to lion killing in the Amboseli-Tsavo region where they work. Please help us with this important work before it is too late. You can support the Lion Guardians by making a donation through this blog. 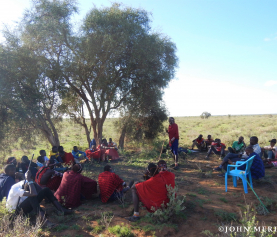 Any amount you can give will help the work of the Lion Guardians, as they reduce human-wildlife conflict in Kenya. thank god for your good and brave work for the lions and other predators. Sadly, i see the same fate for the kenyan lions. land is finite; while human population is unlimited! and let’s not forget this awful drought! KWS has known this truth for a long time; but what have they done to alter or improve the fate of the lions? and what about the government officials? why the deadly pesticide is easily and cheaply bought by any Kenyan or livestock owners? and why there is no reinforcement on illegal settlement? Or better dedicate certain piece of land for those who have none for either their families or their starving livestock? and when the land is overly grazed, where is the action to heal the waste land and turn it back into fertile soil for grazers including the wild ones? Why has the lion not been declared an endangered species? At the rate of decline really serious measures need to be put in place. No lions, no elephants, no rhinos, no tourists, no revenue. Lion Guardians » Kenya’s lions could vanish within 10 years!